Comazzi’s wonderful book includes over 200 of Korab’s photographs which are mostly in black and white although there is peppering of colour work included. Korab’s photographic style (if it can be called such) is rooted in the mid-century modernist architecture that he so often photographed. Sharp lines, elongated curves and ultra clean concrete surfaces are all in evidence. His greatest images capture the beauty of architecture as well as the essence of time and place. I absolutely love this shot. In many ways it is a street photography image. The rear wing in the foreground really ties the image to the 1960s. 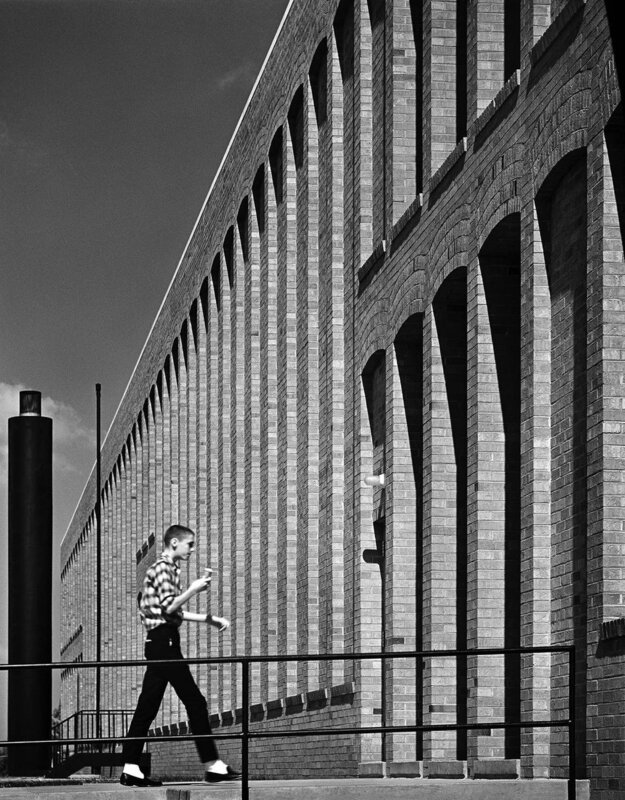 Korab has managed to create an architecture photograph which beautifully captures time and place. It would be foolish to say Korab had a single style, far from it. There are nods to minimalism (see his shot of the Jefferson Expansion Memorial), an approach which really emphasises its arch in all its glory. In contrast there is a definite street aesthetic to some of his work. This is particularly true of his images taken at Lake Shore Drive Apartments (above) and Northside Middle School (below). These are fantastic pictures that show a photographer willing to experiment with style. It is genuinely inspiring to see work from one of the greatest architecture photographers that shows is there is more than one way to shoot architecture. Balthazar Korab: Architect of Photography really is a must own for any photographer who any interest in architecture and urban photography. His ability to create awe inspiring photography is obvious but for me it was his willingness to experiment with different styles that was most intriguing. Something we should all aim for in our own work. More information about Balthazar Korab: Architect of Photography can be found here. Title: Balthazar Korab: Architect of Photography. Author: John Comazzi. Format: Paperback. Size: 8 × 10 in (20.3 × 25.4 cm). Pages: 192pp. Illustrations: 20 color, 200 b/w. ISBN: 9781616891961. Publisher: Princeton Architectural Press.